Dr Migani’s research activities are located in the general field of Neurosciences and particularly in Neurophysiology and Neurochemistry. Migration of neuroblasts in mouse brain, from the subventricular zone (right) to the olfactory bulb (left). Neuroblasts are displayed by their specific marker PSA-NCAM (red) but also by a component which contributes to direction finding (ephrin-B1, green). Migration of neuroblasto of mouse brain out of the subventricular zone (bottom). 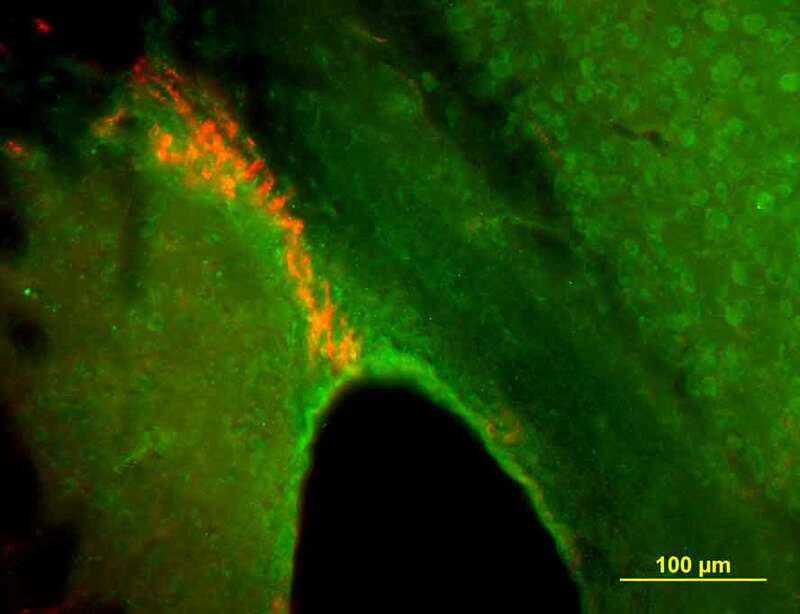 Neuroblasts are marked by PSA-NCAM (red). On the ventricular surface is located a component (green) which seems to repel the neuroblasts. 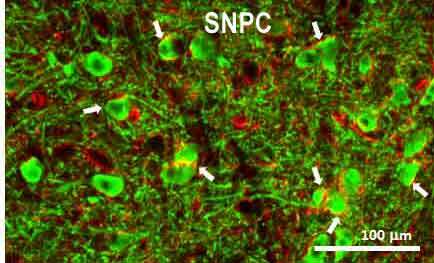 Occurrence of neuroblasts (red) in the Substantia nigra pars compacta (SNPC), mixed to big dopainergic neurons (green). Arrows point to possible neo-formed neurons. - Bench tools for neurochemical and immunohistochemical tests, including two analytical balances and equipments for electrophoresis and western blot. -General tools for the production of brain histology slices, for the immunochemical detection of specific protein components in cells and their tissue localization. -Beckman preparative centrifuge and Beckman ultracentrifuge, equipped with fixed angle and swing-out rotors. -High-resolution chromatography equipment (HPLC; Beckman), for identification and purification of low and high molecular mass components from the nervous tissue.